Cal Solar’s own Martin Webb will be speaking on the history of Solar in Nevada County, and where we are headed. ▪ Green New Deal – so what’s the deal? Kate Gordon is a nationally recognized expert on the intersection of climate change, energy, and economic development. Gordon was appointed Director of the Governor’s Office of Planning and Research by Governor Gavin Newsom on January 7, 2019. Gordon serves as the Governor’s senior advisor on climate. 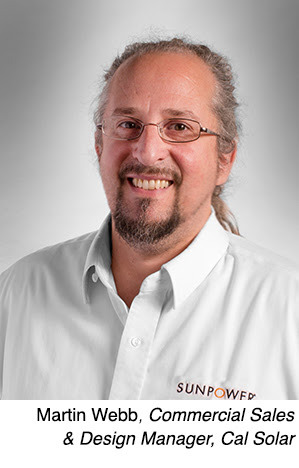 Gordon has worked on a variety of economic development and social justice issues for over 15 years, and is regarded as a leader in the national “green jobs” movement. Phil Starr is a big fan of solar. Starr is owner, along with his wife Anne and son Jackson, of Sierra Starr Winery. “We’ve had solar at the vineyard and winery for just about a year longer than downtown,” he said. And it’s been just about a year since Starr called on California Solar Electric Company (Cal Solar) to install the commercial solar array at the downtown Grass Valley tasting room. Starr is looking forward to the end of November, the one-year anniversary of the solar installation at the tasting room. “We’ll know we sized it correctly based on our usage,” he said. “We expect we won’t owe PG&E any money. If the system is too large, PG&E pays us a little.” Starr reiterated that sizing the installation is important. And he is confident in the expertise of the Cal Solar staff. Starr also gave high praise to the installation crew. Another benefit is that the solar array is not in view from the street. “Customers don’t even know it’s there,” Starr said. 13 Nov BriarPatch Co-op’s Solar Array In Position To Payback In Under 5 Years! Photo: Chris Maher, General Manager of the BriarPatch Co-op pictured next to the array in front of the store. Grocery stores generate very high energy usage. When you consider the ongoing lighting, technology, and warming and cooling in every department, the bills can be astronomical. Such was the case with BriarPatch Food Co-op in Grass Valley. BriarPatch operates under a series of ends policies, similar to a mission statement. They are committed to being conscientious stewards of the land, always considering social, environmental and financial impact when we make business decisions. “We call it a triple bottom line,” Maher said. It is this commitment that brought them to installing solar. While data is continuously being monitored and collected, and will be updated in a future report, Maher said there are significant energy savings since solar was installed. Another unique and challenging aspect was the fact that the BriarPatch is a very busy grocery store and community hub. The Briar Patch array under construction in 2016. With 2019 fast approaching, and decreasing tax credits on the horizon, now is the time to schedule your free feasibility survey with Cal Solar. We have all the information you’ll need on solar, including important details on the federal tax credits and special financing. While deadlines are seasons away, booking now to discuss solar options is a smart first step. 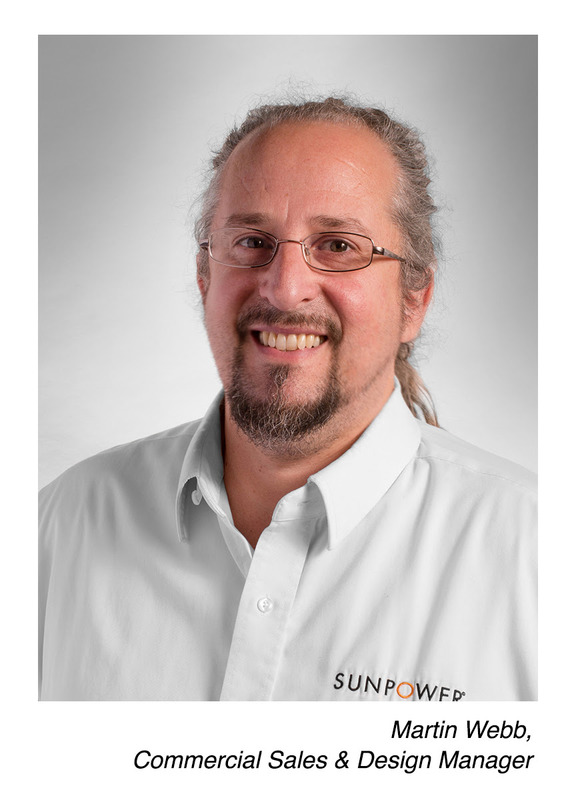 Due to the looming tax credit deadline, “It is anticipated that at the end of next year every solar company is going to be booked out and extremely busy,” said Martin Webb, Commercial Sales Manager with Cal Solar and a solar professional for 20 years. “It’s never too early to start looking at solar and plan for a project next year to beat the rush.” Webb said it is also important to check with your tax professional for clarification on how the credit may apply to you. Homeowner Jay Schwabe is a proponent of solar and recently had a new home system installed by Cal Solar. “I worked for 36 years for Philips Medical as a field engineer installing CAT scanners and MRI machines, so I have a lot of experience with electrical and mechanical repair,” he said. Where the residential tax credit cannot be used: Rentals. The residential tax credit is only good for homes where the taxpayer lives. It doesn’t have to be the primary residence, so a vacation home or a second home qualifies, but it does have to be a home where the taxpayer lives. So if someone owns a rental home as a landlord and wants to put solar on it, then the residential tax credit cannot be used, since they don’t live there, the tenant does. The only way a property owner can have a rental qualify is if they structure their rental income as an LLC or corporation, and then they claim the 30% commercial tax credit. Where the commercial tax credit cannot be used: Nonprofits. No taxes are paid from churches, schools, government buildings, fire stations, parks, and other nonprofits, so the tax credit cannot be captured by those types of groups. “That’s why there are new financing outfits geared towards helping nonprofits go solar,” Webb said. “[The finance company] will own the system for the first few years, capture all the tax benefits, and then pass some of them through to the nonprofit in the form of lower monthly payments. After six years, the lender has exhausted all the tax benefits, so at that point they turn full system ownership over to the nonprofit. Solar is clean energy, and most solar loan payments are lower than your PG&E bill. With the current 30% tax credit and $0-down financing, you can now free up the extra money that you typically send to an out-of-town energy company. Schwabe received an email from PG&E on July 17, 2017 allowing him to turn on his solar system and start producing electricity. Get a quote from Cal Solar today to take advantage of the tax credit. Note: Home being served by solar does not have to be your primary residence. Note: Excess commercial tax credit value can be carried forward 20 years. The Sahara desert is expanding, and has been for at least a century. It’s a phenomenon that seems impossible to stop. But it hasn’t stopped at least one group of scientists from dreaming of a way to do it. And their proposed solution, a grand scheme that involves covering vast areas of desert with solar panels and windmills, just got published in the prestigious journal Science. Eugenia Kalnay, a prominent atmospheric scientist at the University of Maryland, has been thinking about this idea for a decade. Kalnay is small in stature, soft-spoken. But she’s made her name with big and bold ideas. And what could be bigger and bolder than reversing the course of the world’s biggest desert? Her academic adviser at MIT, Jule Charney, was among the first to describe the vicious cycle that can lead to desertification. With drought, green vegetation disappears, and the light-colored dirt that remains reflects more of the sun. This cools the land surface, which in turn means that there’s less heat driving air upward into higher and cooler levels of the atmosphere – the process that normally produces precipitation. So there’s less rain, killing even more vegetation. Kalnay wondered if there might be a way to revive those atmospheric currents. “It occurred to me that the same [cycle] would go in the opposite way, so it would increase precipitation, and vegetation, and then more precipitation,” she says. And then she thought of solar panels. They’re dark, so they don’t reflect the sun’s light. Could they heat up the surface and revive those rain-bringing air currents? Kalnay convinced one of her post-doc researchers to create a computer simulation of an otherworldly Sahara where 20 percent of the land is covered with solar panels. The computer model also turned the desert into a giant wind farm, covered with turbines. Kalnay thought they might also help boost those beneficial air currents. And the simulation turned out just the way she’d hoped. It showed rainfall increasing by enough to bring back vegetation. The model showed the biggest increases in rainfall along the southern edge of the Sahara, the area called the Sahel. The super solar farm she imagines is huge, as big as the entire United States. And it would generate four times as much electricity as the entire planet consumes right now. Kalmay talks of novel high-capacity transmission lines delivering power to Europe and the rest of Africa. I told her that the whole scenario sounds like science fiction. Kalnay disagreed. “It would be science fiction if the technology was not available,” she said. After all, she’s used to imagining the workings of the entire planet’s atmosphere. A few billion solar panels and windmills in the desert? No big deal. A number of investors have explored the possibility of large solar farms in the Sahara, though nowhere near as massive as the scenario that Kalnay has simulated. Those ideas, however, remain stuck on drawing boards. California is ready to remake the U.S. West — or at least its power grid. The legislature is considering a plan to expand a grid serving 30 million Californians to encompass as many as 13 other Western states — if they choose to join the effort. The California Independent System Operator, which currently manages a $9.3 billion wholesale market, would cede authority to a regional body under the proposal, which requires federal approval. It’s an idea that has been discussed in the past but never gone beyond the planning stage. Proponents like California Governor Jerry Brown say a regional grid would cut power costs and boost the use of renewables. But consumer advocates and the Sierra Club warn that the expansion would leave California and its neighbors vulnerable to another energy crisis — think Enron Corp. — and lead to more oversight from the pro-coal Trump administration, which on Tuesday released a plan that would relax rules on coal-plant pollution. “We are worried that California would have to give up its climate leadership in order to form a regional grid,” said Matthew Freedman, a lawyer for the Utility Reform Network. Under a regional system, the state would lose the ability to appoint all of the grid manager’s board members. A regional system could give way to the kind of market manipulations that Enron was infamous for in the early 2000s, exposing consumers to soaring energy costs, critics say. Consumer advocates warn that a single market could stick California’s electricity customers with the bill for an entire region if something goes awry. “We are going to have a lot more of an opportunity for speculation and it is going to come at the expense of California consumers,” Consumer Watchdog’s Liza Tucker said. Proponents say that a number of provisions have been put in place since the energy crisis to prevent market manipulation including enhanced federal enforcement and independent market monitors. “Speculators are quickly caught and punished,” said Carl Zichella, director of Western transmission for the Natural Resources Defense Council. The California Independent System Operator says the regional grid could actually save consumers as much as $1.5 billion a year by 2030, according to a report it commissioned that also indicated pollution could be reduced. Another worry is the feds — whether a multistate system would leave California at the mercy of Trump administration appointees by increasing the Federal Energy Regulatory Commission’s oversight. The bill’s sponsor, Assemblymember Chris Holden, and the Natural Resources Defense Council say those fears are overblown. FERC already oversees California’s grid. The U.S. Environmental Protection Agency on Tuesday unveiled a plan that would dramatically weaken pollution limits on coal-fired power plants by shifting most of the regulatory burden to states in a further assault on the Obama climate legacy. But would greater federal involvement tether environmentally friendly California to policies designed to help coal states that don’t share Western clean-energy ambitions? Some green-energy advocates like the Sierra Club think so, though Holden says the way it’s written ensures that the state will be able to pursue its own climate goals. The governor of Utah — a coal-heavy state — has worried the opposite would happen, saying his state would be subject to California’s green energy mandates. Even if all the kinks get sorted out, the benefits of a regional grid could ultimately be limited if there aren’t enough participants or too many conditions are set. 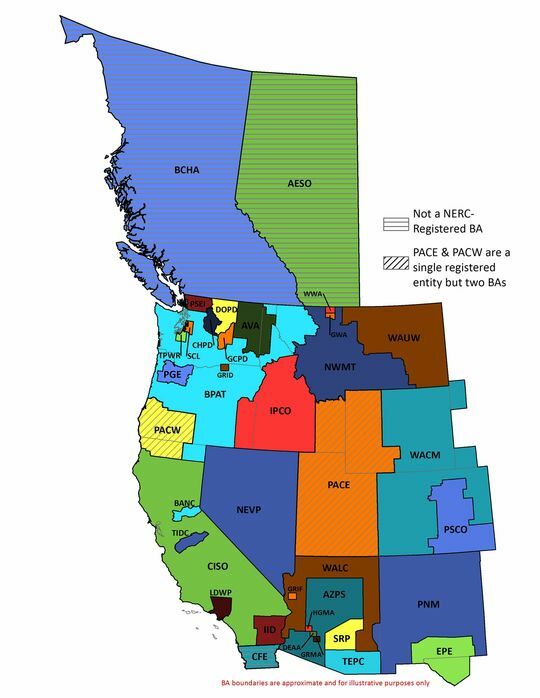 For example, the Bonneville Power Administration, the giant Northwest hydropower marketer for the federal government that also operates transmission ties between California and Oregon, says it wouldn’t participate. “A lot of folks are saying, ‘I don’t know if I’d want to join,’” said Dave Cherney, an energy policy expert for PA Consulting Group. LAS VEGAS (KSNV) — A new solar project has been announced for the Nevada desert near Las Vegas, one that investors say will produce 690 megawatts of electricity. Investment group Quinbrook Infrastructure Partners announced Monday the Gemini Solar Project, which will be built on federal land about 25 miles northeast of downtown Las Vegas. According to a statement from Quinbrook, Gemini would be one of the largest solar projects in Nevada, with a combined capacity of 690 megawatts and 7,100 acres of solar panels, along with the option to include batteries. The first phase of the project would connect with NV Energy’s Crystal Substation and provide power for the local grid, the investment group says. The second phase would be able to send power to customers in Nevada, Arizona and California. The site is next to Interstate 15, close to the Apex Industrial Park and south of the Moapa Reservation. The Bureau of Land Management is reviewing the environmental impact of the site, and a decision is expected by July 2019, with construction due to begin shortly afterward. BLM officials say they are accepting public comment on the Gemini project through the end of August. Scoping meetings are also expected to be held the week of July 30. 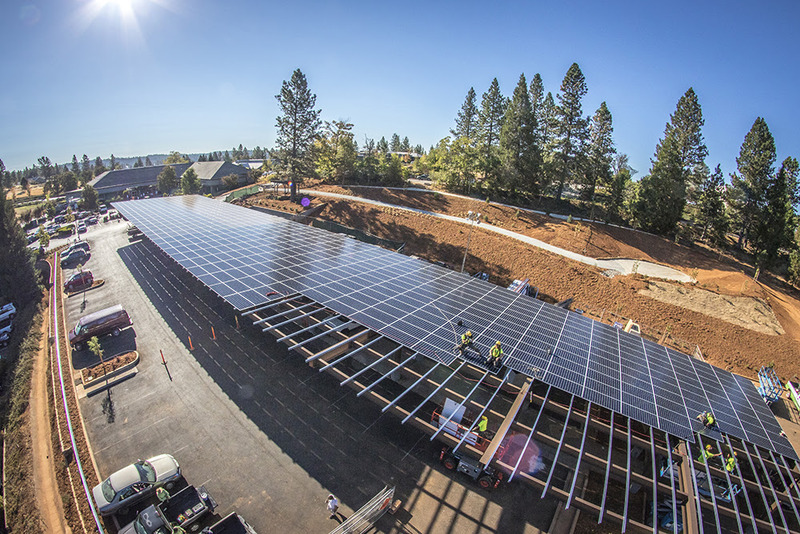 California Solar Electric Company in Grass Valley is installing 37.6 kW of solar power at the Miners Foundry Cultural Center in Nevada City. California Solar is installing the system using SunPower’s 470 watt panels, which utilize the latest and most efficient technology in the industry. Due to their high efficiency, California Solar is able to install the entire system on the most efficient, south facing roof spaces hidden from the street, preserving the historical character of both the Miners Foundry and Nevada City. “We see going solar as an extension of our legacy and commitment to innovation, sustainability, environment, and our community,” Gretchen Bond, the executive director of the Miners Foundry said. For nearly 160 years, the Miners Foundry has been the hub of innovation, arts and culture in Nevada County. Now the Foundry serves as a cultural arts and community events center. The installation of solar will help the Miners Foundry save the money needed to make necessary updates to their historic facility. An additional benefit to the Foundry, and other nonprofits, is a new source of special financing offered through California Solar. When completed, the solar system will be the largest solar installation in the downtown historic district. The SunPower solar system has a life expectancy of over 40 years and will deliver over 58,000 kilowatt hours in the first year. By producing 90 percent of its power onsite, and with the special financing offered through California Solar, the Miners Foundry will save more than $235,000 over the next 20 years, followed by even more substantial savings in subsequent years. “We are proud of the vision, leadership, and commitment our local government has shown in transitioning Nevada City’s electricity to be entirely from renewable sources by 2030 and all energy sources will be renewable by 2050,” Bond said. “It shows true responsibility and passion in preserving this beautiful place we call home. We chose California Solar because of their quick response to our many questions, willingness to work out a number of different scenarios, competitive rates, access to creative funding and ongoing commitment to the local community,” she said. Founded in 2000 and located locally at 149 East Main Street in Grass Valley, California Solar Electric Company has installed more than 5.5 million watts of solar panels. Dedicated to advancing the solar industry and developing the best practices for installation methods, California Solar was listed in the July 2017 issue of industry magazine Solar Power World as one of the Top 500 Solar Contractors in the United States. Remember Keystone XL, America’s favorite zombie pipeline? TransCanada’s long-resisted pipeline, intended to carry crude tar sand oil from Canada to Steele City, Nebraska, has been in the works since 2008, but construction still hasn’t started. The project continues to be hit with protests, lawsuits, and seemingly endless postponements. Activists are not giving up — and they’re using new and creative methods to fight the oil infrastructure. Here’s a quick rundown of how environmental and indigenous rights activists are still building blockades. This is a cheeky effort by a coalition of tribes, landowners, and activist groups to erect solar panels along the pipeline route. The panels generate energy for the local community, and would have to be removed in order for the pipeline to be built. “The contracts say you can’t have any permanent buildings along the pipeline route,” says Jane Kleeb, founder of Bold Nebraska, a group that organizes farmers, ranchers, and tribes against the pipeline. “So TransCanada would be forced to remove them.” Destroying community-built solar installations to build an oil pipeline? Not the best look. Solar XL is part of the broader work that tribal groups have been doing for years to go off the grid, says Faith Spotted Eagle, a member of the Yankton Sioux Nation in South Dakota and an organizer against the pipeline. “We’ve already been moving in the direction of solar,” she says. Planting those panels in the center of the pipeline path is the logical next step, Spotted Eagle points out. A husband and wife near Neligh, Nebraska, have further complicated the situation for TransCanada by selling a 1.6-acre plot of ancestral land to the Ponca tribe. The land, which has been used for the past five years for planting Ponca sacred corn, has now been returned to the tribe permanently. This is likely to be particularly irritating to TransCanada, as they have pointedly avoided running the pipeline through any tribal lands. And they were already forced to reroute the pipeline away from environmentally sensitive areas. But now the Ponca owns property directly along the pipeline route — and they can use their special legal status as a tribe in future negotiations. And — as is increasingly the case in climate and environmental conflicts — there are ongoing lawsuits. Although South Dakota’s Supreme Court shot down an appeal from activists on Thursday, there’s still hope for a similar appeal in Nebraska. The Ponca tribe, Yankton Sioux tribe, and the Sierra Club filed documents in the Nebraska case three weeks ago, arguing that the Keystone XL will have dangerous impacts on the state’s environment and that the state public service commission violated due process in its original ruling. The pipeline will also cross the Ponca’s “Trail of Tears,” the route taken by the tribe during their forcible removal by the federal government in the 1870s. This contested strip of land, the Ponca tribe argues, should be preserved for the public interest and for its religious and cultural significance.